You and I have been together now for about 25 years. When I was little I consumed mainly hamburgers, pizza, rice, and the occasional breakfast burrito from McDonalds. As I grew older I began to eat mainly french fries, then transitioned to an almost all Mexican food diet. Our relationship, while delicious, has not been fair. You see, I keep eating, and unlike many of my skinny friends, I have not been graced with a fast metabolism. My friends who can eat 9 pounds of Taco Bell followed by a gallon of regular Coke and remain a svelte 100 lbs. make rage with a passion of a 1,000 burning suns. Just writing that sentence caused me to gain 4 pounds of water weight alone. I also don't have the grace to turn down food. You know those people who say, "I eat to live, I don't live to eat." Well those people can take a hike. Which I'm sure they'd love. "Thanks for the rest of your cake, cuz I'm gonna eat it." I've tried many a diet. I tried Atkins for a day. Because by noon I was having rage black outs so severe I'm pretty sure I bit a student. 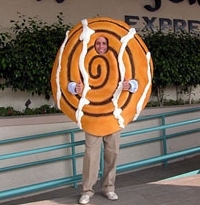 Turns out that when I'm deprived of carbs all people start looking like giant food items with feet. Like a real life Fruit of the Loom commercial...but replace the fruit with potatoes, bagels, chips, and croissants and cinnamon buns. "What about Weight Watchers?" you may ask. Well I've done well on that for a little bit. Then the thought of counting out 14 tortilla chips out as a portion as opposed to shoving 14 in my mouth at once, causes me to snap. This has been on my blog several times but I feel that it is an accurate depiction of my feelings. You may be saying, Ashley, on behalf of food everywhere there are delicious healthy choices. Well let me tell you something player, I went to Trader Joe's on Sunday in hopes to find a whole new world of healthy and convenient options and it was the most terrifying experience of my life for several reasons. 1. I don't know how to make any type of kale and that place is CHALK FULL OF KALE. Also you can dress up kale as a chip if you want but I'm not buying it. 2. I have never seen so many people so excited about produce. This is going to be an up hill battle for sure. It doesn't help that it's fall and there are delicious fall flavored things. I know not everyone is cuckoo for pumpkin stuff but I lose my mind. 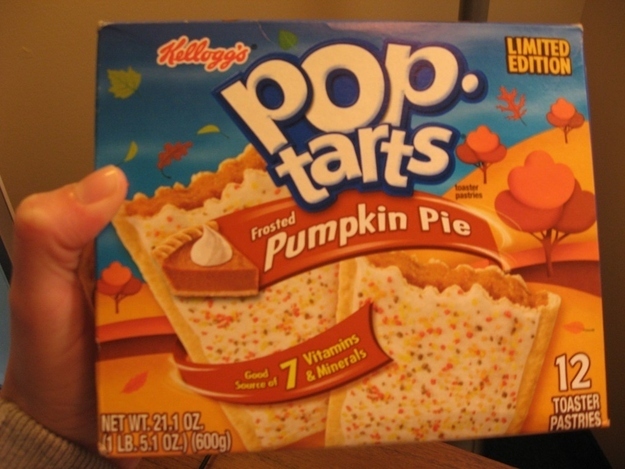 Today there was a link on Buzzfeed that alerted me to the fact that there are PUMPKIN PIE POP TARTS. Why you gotta play me like that world? 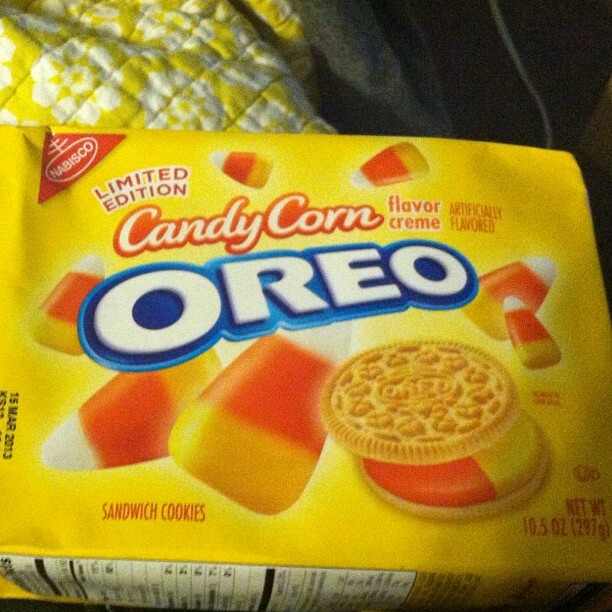 I heard there were Candy Corn Oreos exclusively at Target. When I exercise I feel like that gives me an even bigger excuse to eat what I want instead of what I need. I'm struggling hard here food. You taste so good and hurt me real bad. Now if you'll excuse me I need to go take several gulps of air to fill me up and go to sleep so I don't go on a late night hunt for those damn Pop Tarts. I'm going to look like one of the junkies on "True Life: Meth is My Favorite," where they take late night trips to score. It would be me driving with a night vision camera shining on my face, in my Honda, mumbling about how the 7 vitamins and minerals in the pops (that's what I would call them) were going to be essential for me to function properly as a human. Until breakfast, I bid you adieu. So...funny story...I told myself this week that I was no longer going to eat after 9:00pm...then, 20 nuggets and a large fry and large tea later, I found out Monopoly is back! Forget about the comment I was going to make about now having to drag six kids to Target just to hunt down those oreos- MAMA'S GOTTA GET HER A MONOPOLY FIX!!!!!!! Hi Jones :) It's Dayne (Corey's lady friend). I just wanted you to know I am stuffing my face with cheetos at 1:30 a.m. and laughing hysterically at this post. I hate the Pinterest picture that says "Nothing tastes as good as skinny feels" I call BULL .... BBQ cheeseburgers, french fries of any kind, pizza, Oreos, etc feel amazing on my tastebuds. I know I am a total creeper, but can you please post something every day?? You might be the funniest person ever. And I am buying those oreos today. But Ana, didn't you see? MCDONALD'S MONOPOLY IS BACK!!!! I too, do not understand why everything that is so bad, has to taste so good. Kale is disgusting and the world would be no fun if everyone ate it all the time. Long live the Poptart! If we didn't eat then we would not be able to go to Bobby's Burger Palace and have our burger crunchified...I'll take crunchified over a size 0. Carbs and chocolate are the bane of my existence in this world....I'll take the curves over having the body of an eleven year old boy. Pre-comment note: I got to the end of my comment and realized it was a big run-on and it really didn't read too well, but I'm too lazy to change it so...try to figure it out. Please and thank you. So not only do you outline my exact relationship with food (OK so I caved and bought frozen enchiladas and a gallon of sour cream for dinner last night...and ice cream because don'ttellmewhattodo, life), but you wrap this post up with Fall food goodness (please tell me you've had Einstein's Pumpkin Schmear? That shiz is so good on...bagels, crackers, pretzels, spoons. You see where I'm going with this.) and then you top it off with a Fez-themed ending? We're related. Seriously, I'm talking to my mom tonight to see if there's something she wants to tell me about my missing sibling. you always outdo yourself .. OMG!!!! HILARIOUS! I LOVE YOU! I am not alone! Hurray! Thank you for being you and having the bravery to write this. There are so many of us who can relate. 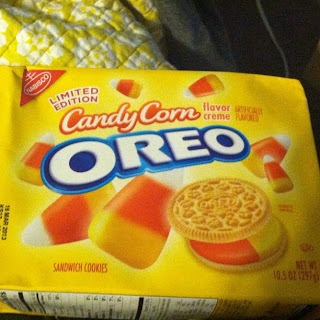 OMG I have to find those Oreos! Let me know when you are home next and I will make you some pumpkin recipes that I have! Love you!!! "My friends who can eat 9 pounds of Taco Bell followed by a gallon of regular Coke and remain a svelte 100 lbs. make rage with a passion of a 1,000 burning suns." Retribution is coming.......You can sympathetically/smugly witness their horror when they hit their 30's and watch the pounds pile on and they wonder why? WHY?? P.S. Thank you for a honest and funny post.